In the span of four days, two Hong Kong journalists were attacked for doing their jobs -- reporting on stories in China. 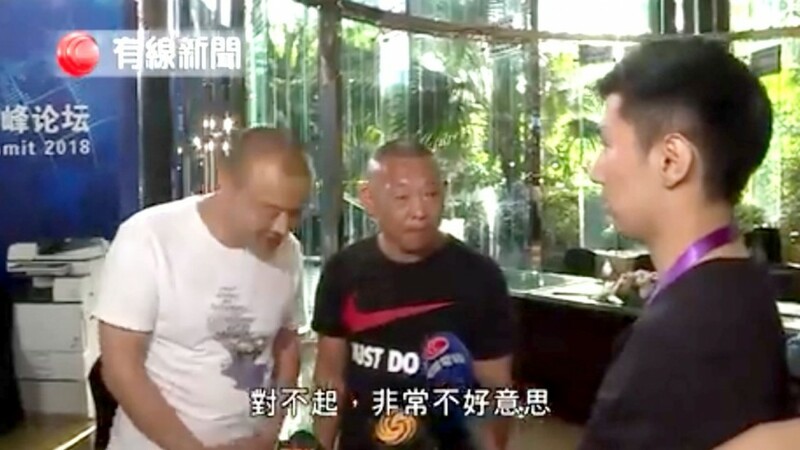 The first happened on May 12 when Chan Ho-fai, a reporter with i-Cable News tried to cover the 10th anniversary of the Sichuan earthquake in Dujiangyan, near the provincial capital of Chengdu. He was kicked and beaten by two men when he saw a group of men surrounding a car with a Commercial Radio reporter inside. "I saw a group of men surrounding a car with a Commercial Radio reporter inside. When I wanted to take a picture with my phone, two men suddenly grabbed me by each arm and dragged me away," recalled Chan. He was dragged from the scene to a nearby river where he was repeatedly kicked and kneed in the stomach at least three times. "When I kept calling for help, they kept kicking me in the head, and kneed me in the stomach... They just kept kicking and wouldn't let me go," he said in a video recalling the incident. It lasted between five to 10 minutes before officials from the city's propaganda department came to separate them. Chan said the two men would not reveal their identities, and one of them said they were from the area. Meanwhile today's incident happened this morning around 9am when Chui Chun-ming, a cameraman for Now TV was covering the Beijing Lawyers Association's hearing that had to do with human rights lawyer Xie Yanyi. On Now TV's own footage, Chui was held down by at least four people and then handcuffed by two uniformed police officers, but not without Chui's left temple bleeding. Just before the incident, Now TV had approached Xie, but were stopped by officers. The crew cooperated with police and gave them their press passes and ID cards. Chui felt the officers were holding their press passes and ID cards for a long time; when he asked for their info back, he was violently forced to the ground and taken away. Xie's wife, Yuan Shanshan, who was there, said Chui was beaten by "five or six policemen," while dozens of officers stand by. "The policemen asked [Chui] for his ID and promised to let him in after checking the documents. But after the examination, the officer refused to return the ID and pressed him to the ground when he asked for it," Yuan recalled. "It was total chaos. 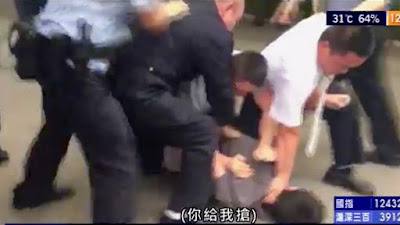 Five or six policemen beat the reporter, hit his head until he was bleeding and forcibly dragged him into a police car. My husband [Xie] was beaten and dragged into a police car as well when he tried to stop the officers from taking the reporter away," Yuan said. At 11am, Chui was taken to a local hospital by Beijing police. There he was uncuffed and his wound was examined. Two hours later he was released. Speaking to Hong Kong media after his release, Chui said he was forced to sign a "statement of repentance". "[An officer] insisted I was wrong and told me to admit it. He said if I don't, I will lose my press pass," Chui said. The statement claimed Chui had tried to "grab" his press pass from an officer. Chui admitted he was emotional at the time, but denied any physical contact. Although he initially refused to sign the statement, Chui said he "had no choice" but to sign it, as he was not allowed to make contact with his company at the time. 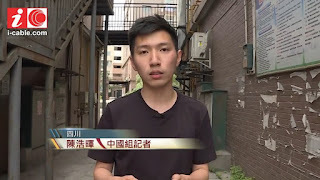 In Chan's case his employer i-Cable said in a statement the company was "enraged" by what had happened, and called the incident "unacceptable", while Now TV lashed out at Beijing police, calling the incident "unreasonable and violent obstruction" of its reporting crew. On Saturday, Hong Kong Secretary for Constitutional and Mainland Affairs Patrick Nip Tak-kuen said the city's leadership was "very concerned about the [i-Cable] incident". Later that evening the two men were suddenly brought to Chan and apologized, saying they had lost family members in the earthquake. When asked to which family members they lost, one of the men gave a strange answer, saying they were from the surrounding area and were neighbours. In Chui's case, acting chief executive Matthew Cheung Kin-chung said the Hong Kong government was concerned about the personal safety and freedom of Hong Kong reporters working on the mainland, and expected no more incidents to happen. What is going on? What have these reporters done wrong that requires them to be violently handled? Were these two incidents meant to scare Hong Kong media into obedience? It's shocking and terrifying to see any reporters being treated this way, and the Hong Kong government must work with the central government to ensure Hong Kong journalists are not harmed. How is there going to be any trust in China when they are roughed up like this?